When I was twenty-five, I packed up my belongings into a U-Haul and moved four states away. No job, no friends, no prospects. Just an apartment (which I got by lying about a job I didn’t have) and the belief that I wasn’t going to be happy staying where I was. It was time for a change. 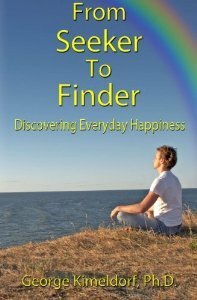 George Kimeldorf, who wrote this book when he was seventy, is all about making proactive changes in order to stop seeking happiness and actually finding it. I’d like to think he would applaud my move. This is a self-help book focused not so much on twelve steps – or any steps, for that matter – but rather on making you think about happiness. What does it look like to you? Feel like? When will you know you’ve found it? Kimeldorf offers a series of anecdotes, some from his life, some from other people’s, with the purpose of guiding you toward creating your own reality. What makes one person happy may not work for you; what works for you may not for another. In Kimeldorf’s mind, we are each entitled to the pursuit of our own happiness. And so he provides a framework for us to change the way we think about happiness. It essentially comes down to one tenet: you have to actively pursue it and actively embrace it. He tells about actually practicing being happy, espousing that before too long, you won’t be practicing. You actually will be happy. Is there anything new or earth shattering here? No. You’ve probably read quite a bit of this before, in other books. What Kimeldorf does so well, though, is pare everything down to their basic points. In telling us stories about his own seeking, he avoids the pitfalls of “first you do this, then you do that.” He leaves it up to us to figure out what will work and what won’t. And along the way, we will stop seeking and start finding, and we will be happy.